Technology and science have led to changes in all areas of life. The methods of mixing and applying mortar have also undergone substantial changes. The machine has become the tool of today. The inventors of the mechanical single-layer gypsum plastering technique, Dr. Alfons Knauf and Karl Knauf, laid the foundations for PFT’s present importance in the 70s. The successful and dynamic enterprise PFT, today located in Iphofen near Würzburg (South Germany) was founded in 1972. 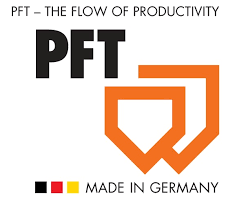 Dynamism and solidarity, combined with entrepreneurial farsightedness, enabled PFT to occupy a leading position among the European manufacturers of mixing pumps and conveying equipment. Eccentric screw pumps, continuous mixers, tools and accessories complete PFT’s product range. PFT machine technology is successfully used in all fields of the building trade and also in industry. The foundation of our success is the consistent involvement and training of efficient specialist traders, providing a region-wide service network, both on national and international level. The PFT distribution strategy is based on fair partnership and focuses on excellent service to our customers. Hardly any customer in our home country Germany will have to drive far to reach an experienced and knowledgeable PFT sales partner – an exemplary service network density that sets the standards in this industry. 150 sales and service stations and a motivated field service team take care of what comes first in PFT’s vision of performance: growth and our customers success. On an international scale, PFT also plays a very active role in the building trade. The Franconian company exports its quality products to more than 40 countries worldwide. Highly qualified advice and service to our customers is always our first priority, even in the most distant regions. The distribution is carried out by authorized PFT sales partners for construction machines and by our own branches. However, PFT is also the symbol of the rapid, modern building site with a future: humane, labour-saving, efficient, silent, waste-free, and environmentally friendly. Thanks to sophisticated technology, economical methods of working and top quality „Made in Germany“, the PFT system is in a permanent process of further development and improvement. The objective is a continuous and trouble-free material flow on every construction site. Performance and skill are appreciated by our contented customers and will remain our commitment – to keep things moving, today and in the future.